Developed in 2009, Edmonton’s Plan to End Homelessness focuses on strategies to eliminate homelessness with housing and support, rather than just managing the problem with short term solutions. Central to the plan is the Housing First approach, where people who are experiencing homelessness are quickly found a home, and then given the supports they need to keep that home. For more information on the update to Edmonton's Plan to End Homelessness and how you can get involved, visit endhomelessnessyeg.ca. Providing Accessible Transit Here (PATH) is a City of Edmonton program that provides free monthly transit passes to individuals who are homeless or are at high risk of homelessness. Supporting individuals experiencing homelessness encountered on public land and getting them on the path toward safe housing using the Housing First Principle. The City of Edmonton and its partners are working together to connect people experiencing homelessness to supports and housing. As citizens, it's not always easing knowing which number to call or what to do! This is how you can help. For individuals who have no home, winter can be a dangerous time with increased risk of frostbite and hypothermia. Print this quick reference on steps you can take to help someone during the winter months. The Winter Emergency Response Guide includes information on winter shelters, extended drop in hours, food, clothing and referrals to services. 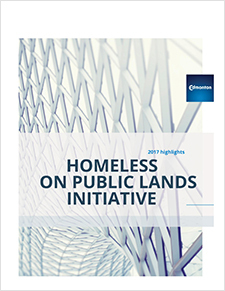 Key activities for the Homeless on Public Lands initiative (HoPL) in 2017. Read about how the Homeless on Public Lands initiative (HoPL) cleaned up 800,000lbs of waste and how the committee worked together to help Edmontonians experiencing homelessness. 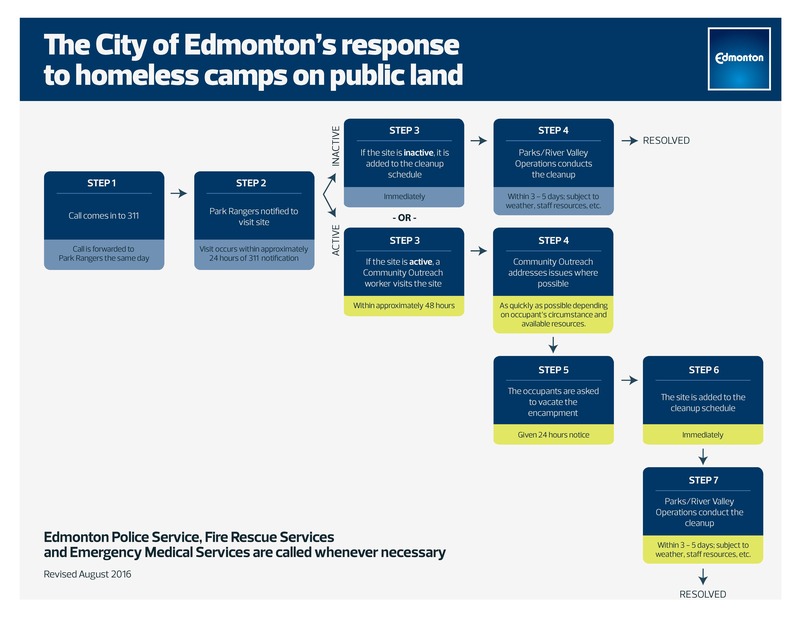 Flowchart: The City of Edmonton's response to homeless camps on public land. Individuals camping on City land are connected to support services and housing options by the Boyle Street Outreach team. The Homeless on Public Lands Committee is a collaborative effort between the City of Edmonton, Edmonton Police Service, Homeward Trust and Boyle Street Community Services. We consult and work closely with other community networks such as the Edmonton Coalition on Housing and Homelessness, Alberta Health Services and REACH Edmonton. To report a homeless camp in the River Valley or other City of Edmonton park or public land (Please call 311 to describe the location of the homeless encampment). Looking for mental health, addictions, shelter, or other support for a homeless individual? Please call 211 for an operator to connect you with the information you need. To report a medical emergency, fire, or illegal activity (beyond camping on public land) occurring in the River Valley or other City of Edmonton park or public land (Please call 911 for an emergency in progress, or the non-emergency Edmonton Police Service line at 780-423-4567).